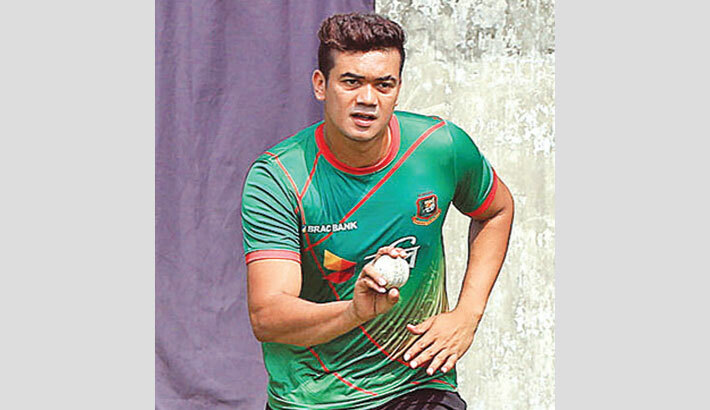 Bangladeshi pace bowler Taskin Ahmed is eyeing Dhaka Premier Division Cricket League (DPL)’s super-league phase to return back to competitive cricket. The right-arm pacer sustained ankle injury while trying to take a catch in the boundary line against Chittagong Vikings in the last edition of Bangladesh Premier League. An MRI revealed that the right-arm paceman needs at least three weeks of rest to recover fully. As a result he was ruled out of the ODI series against the Kiwis after he made his way into the squad on the back of 22 wickets in 12 matches for Sylhet Sixers. “Much better now with the grace of Allah,” Taskin told reporters when asked about the state of his health at Sher-e-Bangla National Stadium on Saturday. “I will have the second running session today (Saturday). I hope to start bowling gradually if everything runs smoothly,” he said. “The intensity of running is increasing and so far I am pain free,” he said. “I will start blowing from this month as it is the plan of the Physio team. According to our plan, I will be taking part in Super League. It may start earlier if the progress seems good. Whatever happens, I’m trying to start after fully finishing the rehab,” he said. Taskin said that he was extremely happy that the team management always made him feel special despite the injuries which took its toll on him. “Actually, the board officials have been communicating with me after the injury. They often followed up with their inquiries. These things inspire me even more,” said Taskin. “Our team’s captain, senior players also kept in touch. Any injured player will be motivated if they get such treatment,” he said. “I had not played in the national team for a year due to injuries and as I was off-form. It will be a little difficult for me but I have to accept the reality. Because I was injured I could not play well,” he said. Taskin said that he is eyeing to be part of the World Cup squad as that is his ultimate dream. “Truly speaking, I am giving priority to World Cup. Because playing in the World Cup is my dream,” said Taskin. “I don’t know what will happen in future but I am not thinking for far ahead. I am giving top priority to me being hundred percent fit and getting a chance in World Cup squad. Because I had played the World Cup 2015,” said Taskin. “I still feel good while recalling memories of the previous World Cup. Another chance has come in this World Cup. I would ask everyone to pray for my health as well as performance. It will be different feeling and can’t be explained in words if Bangladesh can do well in the World Cup,” he said adding that whether he will be in the squad or not is not in his control but he will give his best. “It is not in my control whether I will be in the team or not. The fact that I can work hard is in my control. That’s what I will try to do. I believe if I work hard, the performance will be good,” he said. Though no team yet confirmed Taskin it is understood that if he is fit he will be snapped by one of the top-six teams that will play in the super league.